In an Antique store in Virginia, a friend spotted a desk wastebasket on sale that looked strangely familiar. When she turned it over she recognized the label that had been pasted on the bottom when she had thrown it out a few weeks earlier. That’s when she first discovered that antique store owners in her area made regular rounds through better neighborhoods during hushed early morning hours, cruising for treasures among the trash left out at curbside. And it was amazing, some of the things people so casually tossed out. Last Christmas, at the house next door, I spotted two huge, brand new looking children’s cars (the big kind that kids drive) that had been dumped simply because the kids received gifts of even bigger cars to tootle around the neighborhood. But for street treasures per square foot, I doubt that any place can match Manhattan on nights when furniture and large objects of all kinds are hauled to the curb for next day pick-up. When I moved into my first apartment, these street displays became my Bloomingdales, my chair store, my table store and my antique store. I still have fond memories of roomy straw chairs I carted home and repainted, some louvered panels I turned into a long low table using an andiron for support and a file cabinet I painted black and flipped over as the base for a white wooden top coffee table. Aside from painting, my total cost: zip! And let’s not forget these tables were custom designs—irrespective of what any interior design mavens might label them. Normally used to perusing other people’s discards, I was taken aback one day to discover a stranger thoughtfully sorting through my own trash in the street. Well, not exactly trash. The man had unrolled a pile of my rough drawings, preliminary renderings of an illustration assignment I was working on. I wanted to protest, to say, “No-no, these drawings aren’t made to be viewed. They’re just rough sketches!” Ridiculous of me of course. Once discarded stuff hits the street, it’s strictly finder keepers. But From then on I never threw out preliminary versions of drawings or manuscripts without first ripping them up. There was however, one street treasure that still gives me very real pain to think about. In the days before Antiques Roadshow, I was strolling on the Upper Eastside when I noticed up ahead a rather elegant woman carrying books from her townhouse out to the curb. Naturally, as always when free goodies were on the horizon, I slowed down for a better view of the proceedings. Seeing my interest and smiling affably, she said she was finally getting rid of some old things, and added, “Just help yourself.” So I dived in, looking over the titles while she went back inside and carried out a large stretcher-framed, needlepoint on linen featuring two sailing ships. Ancient looking, stitched with thick, primitive-colored threads, it was the perfect size, the perfect thing I had been searching for to conceal newspapers stored beneath a bookcase. Great! I schlepped it home, and it turned out be exactly right for my purpose. Except for one problem. It smelled absolutely awful: an old, musty, sharply acrid odor. Airing it outside did little to improve its whiffiness. I suppose I could have aired it outside longer, but my impatience got the better of the deal and finally I re-trashed it. And now, when I watch Antiques Roadshow and see experts exclaim over the beauty of needlepoint Folk Art and estimate various pieces at thousands of big buckeroos, I can’t help wincing. 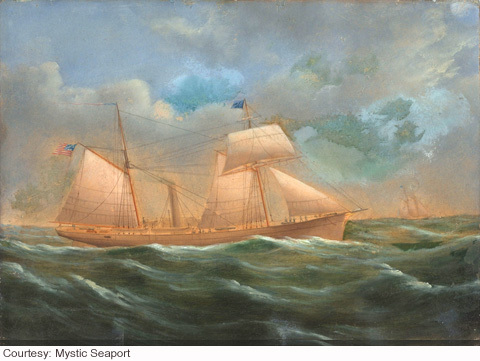 The dagger goes even deeper when these experts rhapsodize over the even more valuable and rare nautical needlework depicting American Sailing ships. I don’t remember my ship’s names, but I distinctly remember that each flew an American flag. Sigh…I could have been rolling in clover. And in fact maybe somebody somewhere was rolling in clover, someone who had carted those ships home from my sidewalk and stayed the course long enough to cash in their chips.